Gregg Rolie band plays Hood River Aug. 19. Gregg Rolie has had an amazing career in rock music and it’s fortunate that there are no signs of the pace slowing down. What’s even more amazing is that, the other day, he took a few minutes out of his day to talk to me, from his home in Texas. We talked about his old bands, his new band, the band that he just got off the road with and the bands he likes to listen to. We also talked about the festivals he’s played at (and believe me, we’re talking about the grandfather of all festivals here) and the song that he’ll probably have to keep singing for the rest of his life, which, fortunately for us, he really enjoys doing. Whew. Oh, and there’s a bunch of other stuff in there, too, but I was too busy writing down all the A-list people he’s played with to remember what those were right now. I’m hoping that you’re in the loop about Rolie’s upcoming show here in the Gorge. If not, you are now, so please double check your calendar for Sunday, Aug. 19, at the historic Columbia Gorge Hotel. The west lawn will be transformed into an intimate concert venue with a full stage and professional sound. Those who were at last month’s Pablo Cruise concert know what I’m talking about, so please spread the word about this show. The manager of the hotel, Paul Robinson, told me he wants local people to re-aquaint themselves with this landmark building, and experience the hotel in a way that’s never been tried before — a summer concert destination. It’s always an undertaking to get programs like this off the ground, and everyone’s hoping that bringing in music acts that normally don’t play in Hood River will generate the interest in continuing the series for years to come. Just last month, Rolie was a member of Ringo Starr’s All-Star Band, which stopped by just down the road from us. And as I mentioned before, Rolie and his own 7-piece band will roll into Hood River next week. I’m thinking the drive to Hood River will be a little easier for him than his experience in 1969, when he had to be airlifted by helicopter over 500,000 folks to play the stage at the Woodstock music festival. And I know that if you show up early enough, you’ll get a front-row seat. You have a show coming up here in Hood River and I appreciate the time you’re taking to do an interview. After all this time, the early Santana music is still very important to you. Why is that? Well, it’s exciting! The main thing about the music that we created back then, the six of us, was the fact that it’s kind of like blues, it never goes away. It is what it is, and it still has the same excitement, the crowds still get just as crazy as they always have listening to this music, and they love it. And I love playing it. Like I’ve always said, If I couldn’t play this right, I’d rather drive a cab. So I’m still in! Will you be doing any other tunes from any of your other bands or projects or CDs? This music will be the hits from Santana that I played and sang on, plus other songs, plus new material that’s of the same genre. It’s all Latin rock, which I’ve always disliked that tag, but I guess you had to call it something. So it’s that kind of music, and it’s a seven-piece band, and it’s an awesome sounding group. Out of all the different keyboards that are out there, what is your favorite to play right now? The Hammond B3, yeah, it’s what I play. I mean, I can play synthesizer, and I can play piano, but I’m really a B3 player. And it’s just such a unique instrument. I was just out with Ringo Starr this summer and the organ just fills the whole band up, that’s what the instrument does, it’s just enormous. And if you mix it right and it’s not overpowering, it just makes the band sound huge, and that’s what happens with it. And I love doing that. And not to mention playing solo stuff, there’s nothing like it. It keeps me interested, and it’s unique to itself. They’ve made copies of (the B3) electronically, and it’s real close, but there’s nothing like that old original wood-cased instrument. How did you get involved in the Ringo Starr tour? The Beatles were such a high water mark in music, they started more music than they probably even know about, because people started bands just because they were there. If you told me I was gonna play in a band with Todd Rundgren I would be like, umm, (laughs) that’s Santana to Todd Rundgren, (laughs) to the Beatles, I mean, let me see, how is that gonna work? But it was an extraordinary experience. And that’s kinda where I was at, I was gonna be an architect, so playing with him was an extraordinary experience, and the band was tremendous. Steve Lukather is an unbelievable guitar player, he plays in any genre you want, and he can play it all. And everybody played hard, on their own music as well as the music of others. And that’s what it takes to make a good band, that’s exactly what happened, we were all kind of blown away, because it was so eclectic. From the stuff I’ve seen on you tube, and all the reviews it really looks like you guys are having a lot of fun. Yeah, I hope we repeat it, it was an awful lot of fun. What is your best memory of the Woodstock festival? (Laughs), well, it’s always the same one, so I’ll tell you too. Well, when we flew into there, people were parked on the highway, and you couldn’t drive in, and all the highways were closed. So, they had helicopters, and we flew in, and I remember an assistant from Bill Graham’s office said “look down there, look at all those people.” Well, I didn’t have any way to guage what size the crowd was when we looked at them from the air, you know, but it turned out to be 500,000 people. We had played to 10,000, 30,000, and 40,000, and all that, there were a lot of festivals during that time, but I really had no way to gauge it, seeing it from the air. And the same thing happened when we hit the stage, it just looked like, you know, after 10,000 people, it’s all hair and teeth. And you really can’t see it all, it’s just a sea of people. After our set I stayed there and I watched Sly Stone, and we drove out that night. It took forever to get through 500,000 people. And that’s when it struck me how big this event was. Luckily, we didn’t drive in, it would have scared me to death! So that worked out for me, it was just another gig, another festival, but it turned out to be the grand father to all of this stuff, and if you were in the movie, you had a career, and that’s what happened to Santana. You were in Santana for the first four albums. What did you feel was happening to that band that made you want to part ways? Well, actually, Carlos wanted to get into some jazz, and you know, a little bit of jazz is good, but that’s not what I wanted to do. I liked the music we developed, and the song “In a Silent Way” was a jazz piece, but to me, it suited the band, and that song made sense to me. But some of the other stuff didn’t make any sense to me, so we had musical differences, and I left. I then started a restaurant in Seattle with my dad, and then I got a call from Herbie Herbert and Neal Schon to play music, so I moved back to San Francisco and that was the start for the band Journey. What was it like touring with Journey? I’ll put it this way, Santana was a phenomena in that all the pieces fell together rapidly. Journey was a well-built organization, and the music was something that was built up. When we started out, we could sell a lot more tickets and albums. If the original Journey had been starting out now, we would have been touring with Dave Matthews, it was really a jam band — and known for the extended solos and high excitement level. And then it turned into a vocal band when (Steve) Perry joined. We made a choice to do that, to become a vocal band, which was real different for me, and a good experience, too. I became a better writer through it all, and the band was really a good one. I haven’t been in bad bands, I gotta tell you (laughs) I’ve been pretty fortunate about it! In 1979-80, you guys spent something like 8 months on the road. Yeah, we called that the Infinity Tour, the album was called Infinity, it was named properly. It went on forever, we used to joke with the tour manager during our travels — we’d announce that “Cairo is just over the next hill!” I mean, wow, we must have gone through Chicago, the airport hub, flying to get to other places at least 11 times, maybe 13, some odd number like that. It was a lot, it was a lot of traveling. Have you ever been up here to the Northwest just to look around and spend some time here? Well, I was born up in Seattle, and I always joke that I managed to move my family out of there when I was 5 years old — I told them it rains too much there — we must leave, (laughs) so we moved to California. I was raised in California, but I’ve gone back to visit, and yeah, there’s something special about the Northwest. I was born there and a lot of my family is up in that area, and it’s pretty, it’s green. But it’s too gray! Yeah, I’m looking forward to it. I think we’ll fit in because this music is made for the outdoors! I hope people show up — if they don’t they’re missing out, and you’ll have to tell them that they missed out on something (laughs)! Do you still maintain a lot of contact with your old band mates? Not a lot, but I have talked to Carlos recently and we’ve been talking about getting back together to do something, maybe playing Vegas. He’s got a resident gig at Mandalay Bay and maybe Mike Shrieve and myself will come in and play with him. Yeah, it would be cool, and so far we’re just talking, so we’ll see what happens. I have talked to the Journey guys, and I played with them a few years ago. I live in Austin now, and they came through in 2009. I sat in with them, which was a rare moment, so you never know, we’ll see what happens! What music do you listen to get inspiration from? Believe it or not, I listen to a lot of country. It’s on the XM radio inside and outside of the house, and whatever I’m doing, it’s just kind of on. The songs are pretty good, I get a kick out of some of the lyrics, they write about some funny stuff! The songs remind of 80s rock with a twang. Some of the young stuff is good, and I’ve gone out to see some bands here in Austin —there’s a ton of bands, tons of places to play, but I don’t really listen to any one thing. Yeah, we put that out in 2009, and it’s a live CD of this band that I’m bringing to the Gorge. It’s the Santana stuff and music of the same genre, the same thing that we’re gonna be playing up there. And we’ll have those CDs for sale. Yeah, I have, and I’ve done that. In 2001 I made a CD called “Roots” that was recorded in my drummer’s house and mine. We had it mastered and mixed in another place, but the recording was all done in home studios, and it sounds awesome. Yeah, you can do just about anything now, but you can’t beat a big room with old tube equipment for getting things like drums, they just sound amazingly better. Most people don’t know, but it really does make a difference. Another thing is to have a big console, and it’s really the analog equipment that makes it warm and sound good. But you can get an awful lot of stuff that can record digitally, and the equipment is all compact and you can just take it anywhere. Was the old Santana stuff recorded track by track or was it recorded with more of a live feel? We did have a live aspect to it, we isolated everybody as best as possible, but the drums always would leak. So it was really on the drummer to get it right. You would play the whole track all together and then if there was enough isolation on specific instruments, you could go back and do it again. That’s kind of when it became popular to have 8 tracks and 16 tracks — you could do things like that. Before multitracks, you just played, or you got fired! (laughs), I mean, no kidding, sometimes, it was like being with Sinatra. His band played, he sang, and it was all recorded at once. I came from an era kind of like that, and then it changed rapidly where you could go in and sing separately and do all those takes and all that kind of stuff. Now it’s gotten ridiculous, with auto-tune — you can hear these auto-tunes in these singers, where the voice just pops around and sounds too mechanical. I don’t much care for that kind of stuff. I still prefer the real music, and you’ve got to be able to play. Drummer Mike Shrieve gave me that Fleetwood Mac album, because he knew I was a Peter Green fan. Peter Green wrote that song, along with another song called “Supernatural,” a gorgeous song he did with John Mayall and the Bluesbreakers. That’s how I first got introduced to Peter Green. Anyway, I heard that song and thought, oh, man, I could sing this! It took me a year to talk the guys in Santana into doing that song, and now, it won’t go away. Carlos has to play it for the rest of his life, I’m afraid. . . (laughs) . . . but I don’t mind, I love singing the song, you know, and I’ve done it for 40 years. Appreciate it, Mr. Rollie, it sounds like it’s gonna be a great show in a beautiful setting. 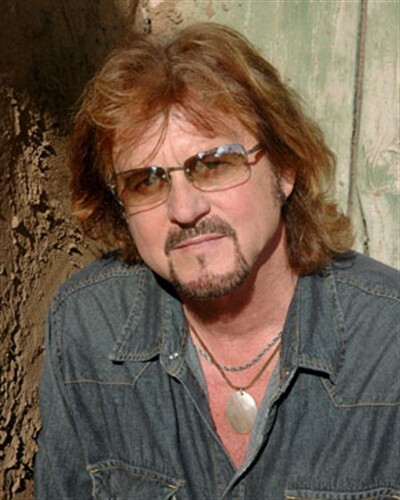 This entry was posted on Monday, August 20th, 2012 at 00:00	and posted in Gregg Rolie, Interview. You can follow any responses to this entry through the RSS 2.0 feed.